There is a natural tendency in scientific investigations for increased specialization. Most important advances are made by narrowing focus and building on the broad foundation of earlier, more general research. This was certainly the case for the French-American Mid-Ocean Undersea Study submersible expedition launched 25 years ago. The mid-ocean target was the rift valley of the Mid-Atlantic Ridge spreading center. In the 1950s, Bruce Heezen of Columbia University’s Lamont Geological Observatory collected wide-beam echo sounder cross sections of the rift valley and correctly surmised that it is part of a global rift system that wraps around the earth like the seam of a baseball. British and Canadian marine geologists took the next step and mounted a series of ambitious expeditions to study the Mid-Atlantic Ridge near 45° N using every geophysical and geological tool available at the time. An American group focused its attention on the rift valley near 22° N. However, the floor of the rift valley itself, where new oceanic crust intrudes and erupts, remained as obscure and enigmatic as ever. The hundreds of active volcanoes that occupy the floor of the rift valley were hidden from depth recorders by booming side-echoes of sound reverberating from the steep, 1,000 meter high cliffs of the valley.Then, in 1972, three years after Neil Armstrong left the first human footprint on the moon, an international group of marine geologists initiated a bold advance: to explore the rift valley with the only vehicles that could take them there—submersibles. Despite a decade or so of deep-sea submersible experience, there was still considerable skepticism about their usefulness as scientific tools. However, those who believed prevailed, the French made the bathyscaphe ArchimÈde and the submersible Cyana available, and the US offered the reliable underwater workhorse Alvin. The French-American Mid-Ocean Undersea Study (Project FAMOUS) was underway. Precise base maps for the dive expedition were assembled using a US Navy classified multi-beam echo sounder, a French narrow beam echo-sounding system, and a deeply towed instrument package from the Marine Physical Laboratory at Scripps Institution of Oceanography (University of California, San Diego). I recall the hushed amazement aboard the research vessel Knorr when we first saw high-resolution, deep-tow depth profiles slowly burned into the paper of our malodorous precision depth recorders. The rift’s center shape finally was revealed clearly as a deep trough nested within a wider rift valley, which contained many hills that appeared to be volcanic cones. These sonar records were the base maps for the dive expedition, and a team of geologists was assembled to be the first mid-ocean ridge divers using ArchimÈde in the summer of 1973. 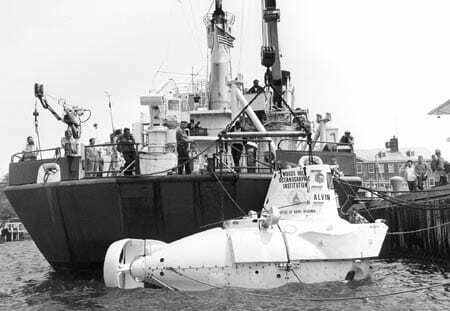 Alvin and the other submersibles certainly proved their worth as scientific tools during FAMOUS, and they have been heavily used ever since. Indeed, the French and also the Japanese have replaced their original subs with vehicles that can dive twice as deep, to depths exceeding 6,000 meters. The FAMOUS geological work showed that the rift valley is created by large faults that break through the newly formed oceanic crust and that active volcanoes are abundant along the rift valley floor. 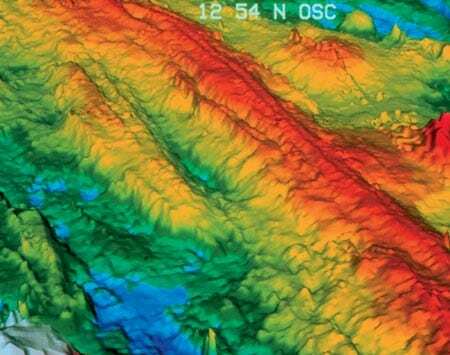 The youngest volcanoes form a narrow zone of oceanic crustal creation only 1 to 2 kilometers wide, remarkable when compared to the dimensions of the plates, which are thousands of kilometers across. FAMOUS magnetic, geochemical, gravitational, and seismic studies resulted in the most detailed and comprehensive investigation of a spreading center up to that time. So much was learned that in 1977 two entire issues of the Bulletin of the Geological Society of America were dedicated to the results of this unprecedented expedition. But the age of discovery on mid-ocean ridges was only beginning. Soon after the FAMOUS results were reported, Alvin was at the center of another mid-ocean ridge expedition, this time to the faster-spreading GalÁpagos Rift in the Pacific Ocean. Heat flow measurements indicated that hydrothermal activity might be occurring on the flanks of this spreading center, and the hundreds of microearth-quakes being recorded there were thought to be hydrothermal or volcanic in origin. Divers aboard Alvin saw much more than warm water; they discovered communities of benthic fauna, including “giant tube worms,” which thrive on the chemical energy provided by spreading center volcanoes. These were, and still are, the only ecosystems known to be based on chemosynthesis rather than photosynthesis. This discovery spawned new hypotheses about the origin of life on earth—and the possibility of exotic life forms on other planets—that are still hotly debated today. Just two years later, in 1979, during an expedition whose goal was to prove the usefulness of Alvin for geophysical measurements, the first high temperature “black smoker vents” were discovered on the East Pacific Rise near 21°N. Our temperature probes were calibrated to 30°C, but initial measurements made from Alvin soared off-scale. When a probe’s PVC mounting rod showed signs of charring, the probe was hastily recalibrated to higher temperatures. The next day, temperatures near 400°C were recorded, breaking the previous GalÁpagos record of 22°C by a wide margin. It was only after the cruise that we learned the melting temperature of Alvin’s portholes was considerably less than 400°C. Ignorance can be bliss! An important change in perspective came from the discovery of hydrothermal vents by marine geologists and geophysicists. It became clear that in studies of mid-ocean ridge tectonics, volcanism, and hydrothermal activity, the greatest excitement is in the linkages between these different fields. For example, geophysicists searched for hydrothermal activity on mid-ocean ridges for many years (including during Project FAMOUS) by towing arrays of thermisters near the seafloor; after all, someone looking for hot water measures the temperature of the water! However, hydrothermal activity was eventually documented more effectively by photographing the distribution of exotic vent animals. Even now, the best indicators of the recency of volcanic eruptions and the duration of hydrothermal activity emerge from studying the characteristics of benthic faunal communities. For example, during the first deep sea mid-ocean ridge eruption when a submersible was in the area, divers did not see a slow lumbering cascade of pillow lavas as filmed off Hawaii in “Fire Under the Sea.” What they saw was completely unexpected: white bacterial matting billowing out of the seafloor, creating a scene much like a midwinter blizzard in Iceland, covering all of the freshly erupted, glassy, black lava with a thick blanket of white bacterial “snow.” The RIDGE Program (Ridge InterDisciplinary Global Experiments-described below) embodies and promotes the spirit of this new cross-disciplinary approach to mid-ocean ridge investigations. Technological developments also had an enormous influence on our perspective. Once multi-beam bathymetric mapping tools were available for nonclassified applications beginning in 1973, we could advance beyond the two-dimensional perspective of the mid-ocean ridge in cross section. For decades, bathymetric charts were artistically assembled from broadly spaced profiles. 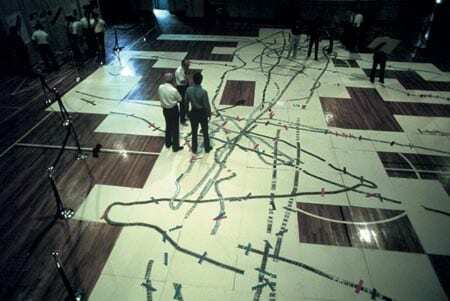 Though the now classic “Floor of the Oceans” chart drawn by Marie Tharp and Bruce Heezen proved to be remarkably accurate, what really happened between profiles, which were often 10 to 100 kilometers apart, was unknown. With multi-beam bathymetric systems, as many as 100 beams of sound could be collected simultaneously over a swath 1 to 10 kilometers wide. In a single pass of the ship, up to 100 profiles could be collected simultaneously and each profile was only approximately 100 meters from its neighbors. When one considers the finite footprint of sound echoing back from the seafloor, the coverage becomes truly continuous. For the first time we could make maps of the seafloor with no significant gaps! No longer need we rely on artistic guesswork for map production. Today’s multi-beam systems emit very narrow individual beams, only 1° to 2° compared with approximately 30° for older, single-beam systems (this is like comparing a laser beam to a searchlight beam). The footprint of sound for each beam in a multi-beam system is only approximately 100 meters rather than several kilometers across. 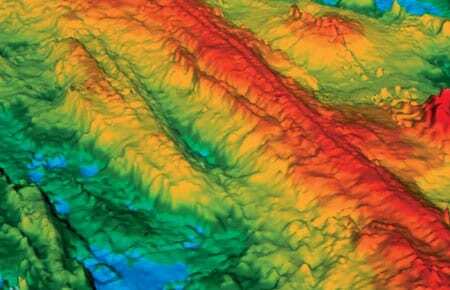 The resulting maps are much more accurate, and reveal seafloor structure in much greater detail. Another fundamental limitation had been navigation. Fixes from satellites and astronomical bodies were infrequent and fraught with error, and there were no landmarks out on the high seas! Rarely did you know where you were within better than 1 to 2 kilometers, so there was no point in collecting data at intervals any closer than that. The Global Positioning System (GPS) began to be available in a degraded format a few precious hours per day at about the same time that multi-beam bathymetric systems came on line. Later, as GPS navigation became available 24 hours per day with precise fixes every 2 seconds (compared with approximately every 2 hours for the transit satellites), 10-kilometer-wide swaths of very accurate seafloor data could be collected and routinely located with precision for the first time. By the late 1980s, my colleagues and I were explaining to incredulous graduate students what it was like in the “old days of being lost at sea” (the marine geophysicist’s equivalent, I suppose, of “walking to school barefoot in the snow going uphill both ways.”) However, our tales fell on deaf ears as our students complained about navigational errors as large as 50 meters and how these minuscule (to me) errors degraded the collection of some data sets, such as those for gravity. Maps are powerful: They inform, excite, and stimulate. Just as the earliest maps of the world in the sixteenth century ushered in a vigorous age of exploration, the first high-resolution, continuous-coverage maps of the mid-ocean ridge stimulated investigators from a wide range of fields including petrology, geochemistry, volcanology, seismology, tectonics, marine magnetics, and gravity as well as some outside the earth sciences including marine ecology, chemistry, and biochemistry. For earth scientists, the combination of high resolution swath mapping tools and precise navigation allowed us to abandon our fixation with the straight transects across ridges instilled by our geologic training and very much in vogue during Project FAMOUS. While such an approach was useful in the early days and still has its applications, we have found that the most revealing variations are often observed by exploring along the axis of the active ridge. This new, along-strike perspective reveals the architecture of the global rift system. The ridge axis undulates in a systematic way, defining a fundamental partitioning of the ridge into segments bounded by a variety of discontinuities. The segments can lengthen or shorten, and they have cycles of increased volcanic, hydrothermal, and tectonic activity. The new maps and the marine geological studies they have stimulated reveal a hierarchy in the segmentation of mid-ocean ridges. First-order segments are generally hundreds of kilometers long, persist for millions to tens of millions of years, and are bounded by relatively permanent, rigid-plate transform faults. These faults had been discovered with the old wide-beam echo sounders, but their structural complexity and influence on neighboring ridge segments could not be appreciated without the new generation of maps. As illustrated below right, a first-order segment is usually divided into several second- or third-order segments that survive for less than 10 million years to less than approximately 100,000 years, respectively. These smaller, less permanent segments are bounded by a variety of nonrigid discontinuities that can migrate along the length of the ridge. Thus these finer scale segments can lengthen, shorten, or even disappear completely. At the finest scale, fourth-order segments, which are on the order of 10 kilometers long, may survive as distinct conduits for crustal accretionary processes for only 100 to 10,000 years. These segments are the products of a series of dike intrusion events, the fundamental units of crustal creation. Dikes form when molten material rises through vertical cracks and fissures. The longevity of these fourth-order segments and associated cycles of magmatic, volcanic, tectonic, and hydrothermal activity exert a controlling influence on the distribution and survival of exotic benthic faunal communities that flourish in the dark, cold, hostile environment of the mid-ocean ridge. 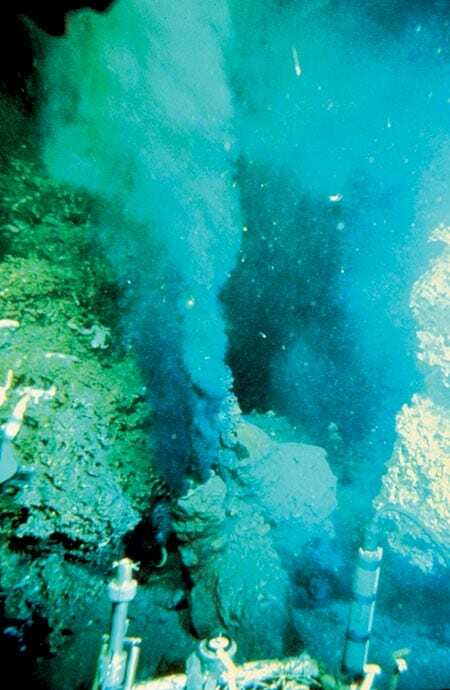 • abundance of hydrothermal vent communities. Today, marine geophysicists and geochemists often attend the talks of benthic ecologists and vice versa; this was very unusual 20 years ago. So, in spite of recent budgetary traumas, mid-ocean ridge research is more exciting and more interdisciplinary than ever before. 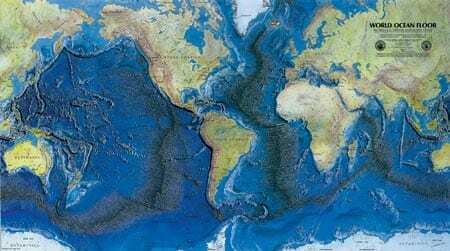 We have now mapped nearly one-half of the global mid-ocean ridge system along a narrow corridor that defines the spreading center plate boundary, a remarkable advance considering we had mapped less that one percent of the system only a decade ago. But we have explored with submersibles or remotely operated vehicles less than one percent of this fascinating zone of crustal plate creation where more than 90 percent of the earth’s volcanic activity rumbles on. 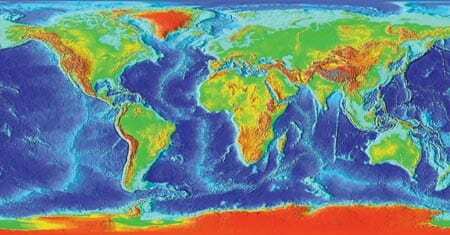 Outside this narrow ribbon, on the flanks of the mid-ocean ridge system, less than one percent has been mapped and less than .001 percent has been explored. Compare this with the mapping of the surface of Venus—which is close to 100 percent complete. The low-resolution view of the global seafloor provided by recently published GEOSAT maps provides a host of tantalizing targets for further investigation. I suspect that some of the most exciting discoveries lie ahead in the near future. What a great time to be a marine geologist (if you can get a job)! Both the National Science Foundation and the Office of Naval Research support mid-ocean ridge tectonic studies. Ken Macdonald graduated in 1975 from the MIT/WHOI Joint Program in Oceanography and has since served a dozen years as a member of the Woods Hole Oceanographic Institution Corporation. He has had the pleasure of seeing several of his undergraduate students go on to the Joint Program, and several of his graduate students join scientific staffs at Woods Hole and elsewhere. Ken has led over 20 deep-sea expeditions and has had the good fortune to participate in some of the first explorations of the mid-ocean ridge using multi-beam echo sounders, remotely operated vehicles, and submersibles. He says he finds mid-ocean ridges as exciting and mysterious as when he first encountered them—and experiences delusions of understanding how they work that are short-lived and illusive. biomass previously unknown on Earth. supply, and axial thermal structure. parts of the global ridge system. of crustal magma bodies at even the fastest spreading ridges. kilometers) in the global mid-ocean ridge system.  The first measurements of plate motion on a mid-ocean ridge. 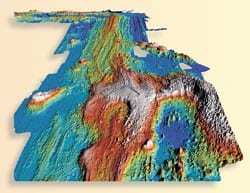 This 1977 World Ocean Floor image was the last in a series produced by Bruce Heezen and Marie Tharp at Lamont-Doherty Geological Observatory of Columbia University from somewhat eclectically collected and widely spaced seafloor data taken over a 30-year time span. By the mid 1980s, this map could be produced from many wide-beam echo sounder data sets assembled by the National Geophysical Data Center. The figures opposite and on the back cover are products of later, more sophisticated multi-beam echo sounder data. Shaded relief image of the fast-spreading East Pacific Rise at 12°35’ to 13° N enlarged from the northern part of the image above. The 12°37’ N overlapping spreading center is in the foreground; the 12°54’ N overlapping spreading center is in the background. These discontinuities offset the ridge axis only 1 to 2 kilometers and define a fundamental segmentation of the spreading center that went unrecognized until multibeam echo sounders were available. The axial summit trough is large enough here (some 500 meters wide by 50 meters deep) to show up as a small axis parallel groove along the crest of the East Pacific Rise. French and American Project FAMOUS scientists laid out US Navy supplied mid-ocean ridge photos on a gymnasium floor as part of their pre-cruise planning. 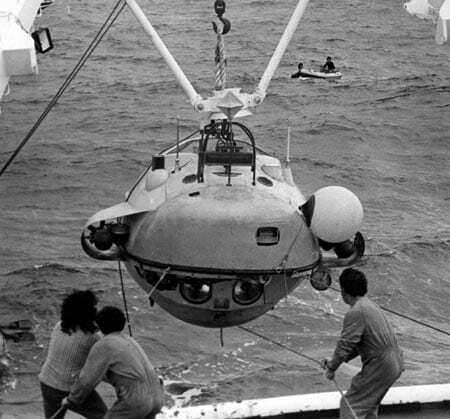 Alvin and the French submersibles Cyana, shown here, and Archimède, a bathyscaphe, took Project FAMOUS diving scientists to the seafloor. Archimède made preliminary dives in 1973 and all three subs dove in 1974. This photo, taken in 1979 on the East Pacific Rise at 21°N, is the first ever taken of a black smoker vent. Scientists didn’t realize how hot the erupting water could be until their temperature sensors came back charred! The Alvin group prepares to lift the sub to Knorr’s fantail for the trip to the Mid-Atlantic Ridge dive sites of Project FAMOUS (French-American Mid-Ocean Undersea Study) in 1974. Knorr towed Alvin’s tender Lulu to the Azores, where the sub was transferred back to its support vessel. Mid-ocean ridges have segmented architectures. 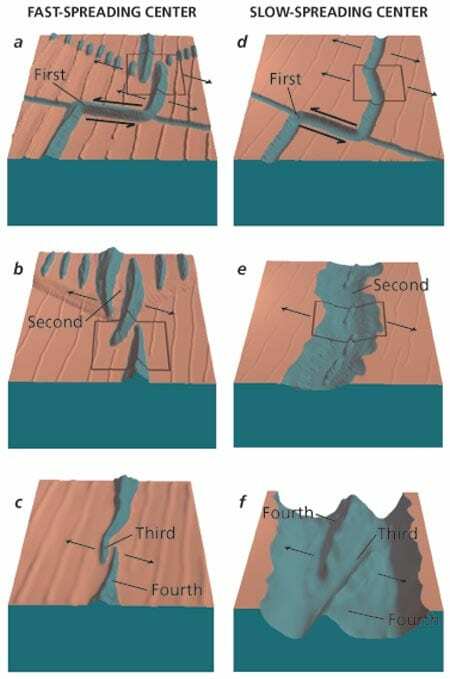 The underlying processes differ somewhat in fast- and slow-spreading centers, but in general, first-order segments are hundreds of kilometers long, persist for millions to tens of millions of years and are bounded by relatively permanent, rigid-plate transform faults. First-order segments are divided into several second- or third-order segments, bounded by a variety of nonrigid discontinuities. These smaller segments lengthen, shorten, or even disappear in 10 million to 100,000 years, respectively. At the finest scale, fourth-order segments, about 10 kilometers long, may survive for only 100 to 10,000 years. These segments are the products of dike intrusion events, the fundamental units of crustal creation.